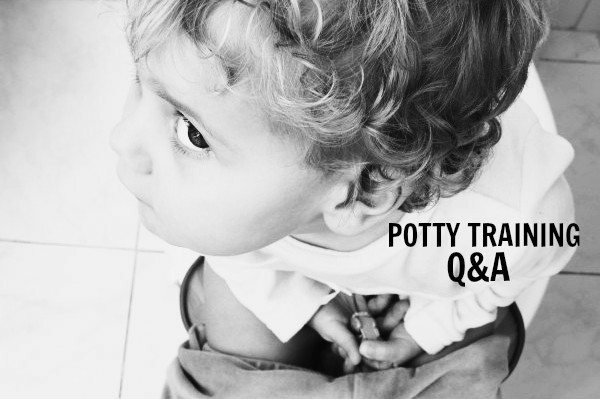 I know you’ve written about potty training a million times before, but I can’t find a good answer to this conundrum anywhere, so I’m hoping you can help. My 28 month old son is SO CLOSE to being potty trained, and thank you thank you thank you for all the previous columns and advice that helped me survive the weeks of pooping in his cloth training pants (which he is convinced are big boy underpants, and I’m not telling him differently until he outgrows them or they fall apart). I took to heart some advice about trying to have “incentives” and “rewards” instead of bribes, but, seriously, that’s a fine line, and then I went out of town for a business trip and the sticker-based incentive system (after a certain number of stickers, he got a small toy, and he also got 1 hershey kiss for pooping on the potty, though with certain restrictions after he started trying to, um, stagger his needs throughout the day instead of just going once) had turned into an M&M based bribery system. That much candy made me uncomfortable, so to try to back away from that we invested in a bunch of cheap matchbox cars and told him that every day he went with no accidents he would get to choose one of the cars as his prize. He still got M&Ms when he remembered to ask for them, but mostly he was focused on the cars and forgot about the candy (and didn’t need to be bribed to sit on the potty in the first place). Complicating factor: his baby sister is due in two months. I am anticipating a major regression around then, but he was clearly ready for training when we started, and we hadn’t wanted to wait and miss the window (particularly since he has to be totally completely no joke trained when he starts preschool next September). I worry that if we phase out the cars closer to when the baby comes, he will blame her. Stopping cold turkey now seems hard. Continuing to give him cars every day for the next several months seems excessive and expensive. -How Many Cars Does One Toddler Need? For the record, there is NO JUDGMENT from me on your choice of incentive. You do whatever works. My kids were rewarded/bribed with all sorts of stuff: Buttons! Thomas underpants! Chocolate chips! (Our artificial-color-free alternative to M&Ms.) DVDs! Ice cream cones! Restaurant outings! Lots of parents end up throwing sugar and/or money at the potty training process. Because it works. So…Matchbox cars worked. High five. But you’re right, it’s probably time to move on. His habits are now well-established enough that any regression/uprising would ultimately be pretty temporary. The new baby on the way thing, however, does indeed give me pause and is holding me back from telling you to just go cold turkey when the current stash of cars runs out. But since he picks from the stash and can thus see and understand that there are no more cars, you can take that opportunity to implement a more challenging/realistic incentive plan. There aren’t any cars left, so he can’t get a new car every day. The end. BUT! Here’s your old sticker chart and you can earn a car by getting a sticker every day for a week. Make it a Friday thing, or give him some alternate fun choices — we’ll go out for pancakes on Saturday, or go to a museum or a favorite playground. That might cushion the blow of losing his daily car tradition, but still give him something to look forward to. If he forgets and announces that he had no accidents and is expecting a car, respond with praise first and then gently remind him that there are no more cars, but! He gets a sticker and is one more day closer to whatever reward you’ve agreed upon. And honestly, I think a modest weekly reward is still pretty fair and deserved at this point — yes, he’s more or less trained but it’s still an effort on his part to stay completely accident free every day. And then! The weekly reward chart can easily transition to other target behaviors, once you’re convinced that the threat of regression has past. Not being rough with the baby, for example. Putting his clothes in the hamper by himself or picking up his toys. No tantrums or trying a new food at dinner. You can keep the potty goal on there — it’s usually best to keep behavior charts relatively short and have a mix of “easy” things that you know he’ll accomplish and only one or two behaviors or tasks you’re actively targeting for improvement. So a sample chart for him could be three things: Staying dry (easy), plus two more daily routine-type items that are a little more challenging for him. Each week you start over and eventually you can remove the staying dry goal altogether. If you think the sticker/behavior chart isn’t really his bag and you’d rather stick with a daily reward (at least until the possibility of a new sibling regression window has closed), I’d suggest buying a big assortment of super-cheap-o “treasure/prize box” toys and let him pick from there. (Think the kind of crap they give out at kids’ dentist offices, like this or this or this.) If you have a party supply store in your area, fill up a bag with items from the party favor aisle — they’ll be way cheaper than Matchbox cars, your son will probably dig the novelty of picking out his own “prize”…and yet ALSO the novelty will eventually wear off because yeah, in reality the toys aren’t anything THAT awesome. One day he’ll probably look through them and decide that he’s taken everything “good” out of the treasure box and lose interest. And hopefully by that point you’ll feel more comfortable going cold turkey on the rewards anyway. I also second the idea that rewards can be privileges. With a new baby coming, privilege rewards can also reinforce that babies wear diapers but big kids go to the potty AND get to do lots of other cool stuff with Mom/Dad/babysitter/Grandma as a result. That could well be enough to shorten any regression, plus you won’t have a gazillion more cars to pick up! For pretty much all the stated reasons, we have now ditched the incentive/bribe/reward system in favor an “Ellyn Satter version of rewards” – regularly scheduled treats like movie night, fro-yo, etc. if something isn’t going right that day or that week, then whatever regularly scheduled event is coming up gets canceled. Has been an amazing change for our house. Hahaha, “I Am Not Dealing With Man Poops”. Amy, you’re the best. It might be less of an issue than you think. At my house, we just ran out of jellybeans one day, and that was the end of it. I did warn him for a few days beforehand. We are almost out of jellybeans, tomorrow no more jellybeans, etc. And that was that…. THANKS THIS IS ALL SO HELPFUL. Especially the part about how we aren’t the only morons with no endgame. I think I’ll follow the advice to stop when we run out (probably tomorrow! ), but revert to the sticker chart + weekly prize, because, seriously, there are so many cars in our life right now, not to mention Halloween candy. You could also transition from getting a car to getting to play cars with mom or dad. Like when daddy comes home it’s a 15 minute block of car play, or whatever other thing your son would like to do. Later, after the baby is born, you might switch it to a baby-free block of mommy time once daddy gets home. My son totally did the stroller thing so we just wore the baby and let him ride in the stroller. My kids are early walkers so by the time she was 1 she wanted to walk anyway. Even now at 4.5 and 2 he still prefers to ride (despite being a very active kid) and she insists on walking. A friend gave me this idea. We just slowly eased off on them. For the first couple days, when they asked, “Oh, I don’t know where the treats are. Next time, I’ll give you one.” And then a few days after that, “Hmm. I think you’ve had enough candy for now. Maybe later today after you go potty.” And then, “Maybe next time.” I gave them more and more sporadically, and after maybe a week, they stopped asking. Starting to potty train our daughter. Reading the experiences of other parents is beneficial. Pants: use only elastic waist pants. No buttons and zippers. We didn’t think of this until our son started preschool and the director suggested that’s all we send him to school in…and ohhhhh. We had a bunch of button and zippered pants, but switched them out for all elastic with one trip to the local kids’ resale shop. Our at-home-always-needing-help-with-pants problem was solved. We lucked out. We gradually switched to the weekly rewards and he…almost didn’t notice? I mean, he noticed, but he didn’t need the rewards any more. And, also, the baby came and he didn’t regress. There was a lot more disruption than anticipated (a more complicated birth/recovery) and he handled it like a champ. He had one accident and that was it. She’s almost 5 months old now and he’s adjusted brilliantly, potty-wise and otherwise. Obviously the other shoe will fall soon.